Dogged by environmental concerns, plans for Western Washington's first large wind farm may wither this summer unless the developer can recruit utilities to replace the largest investor, which indicated last week it will drop out rather than pursue past July a project with an uncertain future. Energy Northwest, a consortium of public utilities, has started looking for utilities to buy out Grays Harbor PUD's 49 percent share of a wind farm planned for Radar Ridge near Naselle in Pacific County. PUDs in Pacific, Mason and Clallam counties own smaller pieces of the project, which has come under fire from the Audubon Society and other bird advocates because the 32-tower, 82-megawatt wind farm would be near a nesting area for marbled murrelets, a federally protected species. Energy Northwest says its studies show spinning rotors would pose little danger to flying marbled murrelets, but a skeptical U.S. Fish and Wildlife Service will require an environmental review that could take until the end of 2011 and double planning costs to more than $5 million. Energy Northwest Vice President for Energy and Business Services Jack Baker said Friday no PUD has yet indicated an interest in buying out Grays Harbor, but Energy Northwest has just begun recruiting new investors. "I'd be disappointed to just walk away because it's hard or uncertain," he said. In hopes of making the project more attractive to utilities and acceptable to state and federal regulators, Energy Northwest this month and next will test an experimental radar system, called Merlin. Energy Northwest hopes the tests will show Merlin could detect small and fast-flying marbled murrelets in time to shut down rotating blades and prevent bird strikes. Grays Harbor PUD commissioners agreed last week to help pay for the radar study, but only to improve their chances of selling out to another utility. By mid-summer, the PUD will have spent nearly $1 million on the wind farm over the previous three years. If radar tests go well, the PUD hopes to "at least recoup a portion" of its investment, General Manager Rick Lovely said Friday. If the tests don't go well, Lovely said he believes getting permission from the Fish and Wildlife Service to build the wind farm will be "extremely challenging." Baker said failure of the radar system would not be a fatal blow. "The project does not hinge on the outcome of the Merlin study. It could enhance it, but it doesn't hinge on it," Baker said. Pacific County and Mason County PUD No. 3 also have agreed to fund the radar study. Clallam County PUD commissioners will discuss it Monday. PUD manager Doug Nass said Friday that he expects commissioners to follow Grays Harbor's lead. "Grays Harbor is the major partner. We were looking at what direction they were going," he said. Cowlitz PUD likely won't be interested in Radar Ridge. The utility's share in wind farms in Central Washington has positioned itself to meet voter-imposed mandates to invest in renewable energy. "We don't have plans in the foreseeable future to develop any more wind resources," Cowlitz PUD spokesman Dave Andrew said. Green-energy requirements could help Energy Northwest find new partners to develop Radar Ridge. But deadlines to invest in sizeable amounts of renewable energy are still years away. In the meantime, state or federal lawmakers could change the rules. "There's a little bit of a lack of urgency," he said. "Nobody wants to pass on a good wind project, but no one wants to commit too early." Utility officials say Radar Ridge is a good spot to introduce large-scale wind generation to Western Washington because strong winds blow over the ridge in the winter, when winds tend to weaken east of the mountains. A Cold War-era military radar station was on the ridge in the 1950s and '60s. The ridge has been logged, and there is a rock quarry and roads there. Lovely said that standing on the ridge, he couldn't see how the wind farm would harm marbled murrelets. "I'm still hugely disappointed," Lovely said. "I'm just sitting here going, 'This makes no sense.' 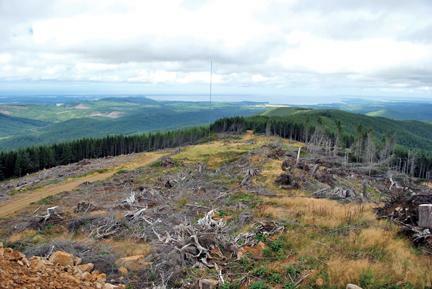 "
From early on, the Fish and Wildlife Service said the ridge's proximity to marbled murrelet habitat would subject the wind farm to close scrutiny. As part of its review of the project, the Fish and Wildlife Service will have two public meetings to explain the proposal and gather comments on what the review should include. The meetings will be 7 to 9 p.m. Tuesday, June 15, at the U.S. Fish and Wildlife Service office in Lacey, 510 Desmond Drive; and 7 to 9 p.m. Wednesday, June 16, at Naselle High School, 793 State Route 4.